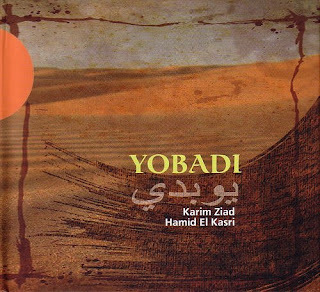 Based on texts both praising God and the Prophet that become hymns to tolerance in a world of brutality as well as invocations of patron saints and healers called upon to give us their blessing, this recording is presented as a symbol and a synthesis between the most treasured past and the most daring creativity. Yobadi follows in the gnawa diffusion tradition whose advocates number Jimi Hendrix, Randy Weston, Jimmy Page, Robert Plant, Sapho, Brian Jones, Norwegian hip-hop group Imhotep and the eponymous Gnawa Diffusion. As well as being an ace drummer Yobadi front man Karim Ziad is artistic director of the legendary gnawa festival in Essaouira in Morocco and his band's performance was one of the highlights of last year's festival, which is where the video and header photo were shot. 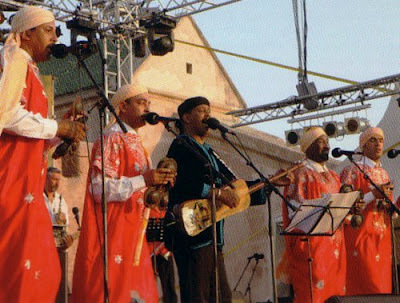 Gnawa is a musical expression of Sufism and Essaouira is the pre-eminent zawiyya (place of meeting and learning) of the Sharifian sufi realm. Now read about Paul Bowles and Jimi Hendrix in Essaouira, about the gnawa spirit of the city, about gnawa and trance rituals, and about the Sufi soul, and then listen to podcasts of Sufi and Moroccan music.